I first learned of a recently added database at Ancestry.com - U.S. National Cemetery Interment Control Forms, 1928-1962 - from Valerie at Begin with 'Craft'. I have at least a couple of ancestors buried in military cemeteries, so I tested the search with my surname of Lincecum. Only one hit was returned, but it was an expected one -- Val Dies Lincecum II at Ft. Sam Houston National Cemetery, Texas. Val Dies Lincecum, Jr. was a son of Val Dies Lincecum and Mary Elizabeth Murray. Val, Jr. was born 29 July 1912 and died 21 December 1957. 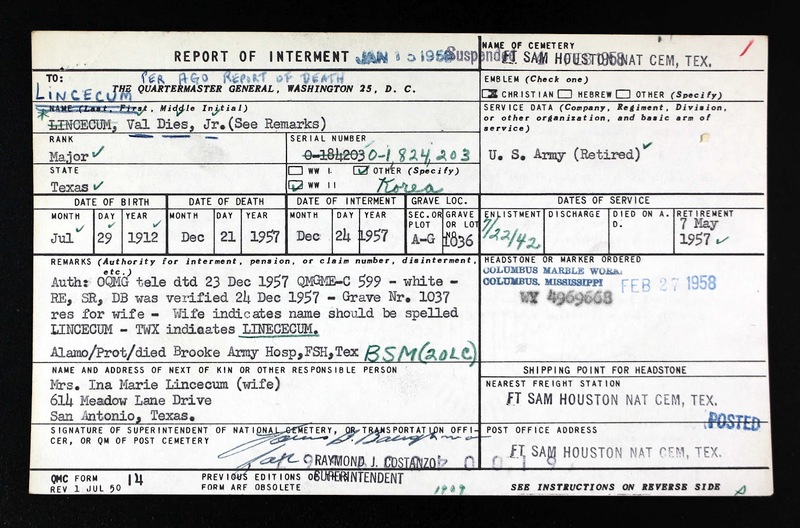 The report of interment included the same birth and death information I had. A big plus for me was seeing the first name of Val, Jr.'s wife, Ina Marie. Even though I had his death certificate, this was news to me. 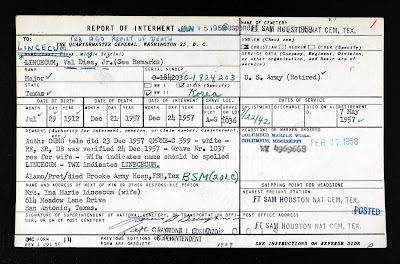 His death certificate only stated he was married, offering no names, and the informant was listed as "Official Records, Brooke Army Hospital, Ft. Sam Houston, Texas" (his place of death). Something I found a bit poignant was the timing of Val, Jr.'s death. It was only 7 months after his retirement from the US Army, and he was buried on Christmas Eve. Val, Jr. rests in section A-G, grave #1036. A spot next to him was reserved for his widow, but I don't think she used it (or, maybe has yet to do so?). Val, Jr. obtained the rank of Major in the United States Army and served in World War II and Korea. He was my 4th cousin. Stephanie -- to update your notes on Val Dies Lincecum, Jr.: this was my father, and yes, his burial was on Christmas Eve -- I was 12 years old. My mother, Ina Marie Maris (Lincecum) Miller passed away this year, Feb. 6, 2015, at the age of 96. She is buried in Austin Memorial Cemetery in Austin, Texas.